If your “Farley” rest doesn’t feel as precise as you think it should or doesn’t hold it’s position, replace the tension screw buttons with our tension screws. 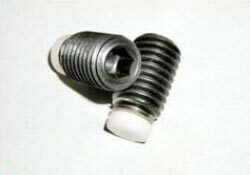 These replacement tension screws are fitted with a “Delrin” pad supported by a pair of “Belleville” washers. These replacement screws will give a much better feel to the action of the rest. Threads are .625-11 (5/8-11). Price is for a pair (two) of tension screws which will update one “Farley” rest. *International Shipping – We appreciate our international customers, but as shipping varies these shipping costs will be estimated case by case. We like to keep our ordering simple as each of our stands is made to order to ensure the highest quality. To order one of our fine products, please go to our order form page. Enter your information as well as the quantities you need. ©2019 Shadetree Engineering & Accuracy All Rights Reserved.